Remarked by her contemporary Coco Chanel as "That Italian artist who makes clothes" Elsa Schiaparelli (New Yorker - Janet Flanner) bought Surrealism to fashion. She was one of the most influential creators of Parisian haute couture in the era between the two World Wars. Starting with a knitted tromp l ‘oeil bowknot sweater she opened her boutique in 1927. 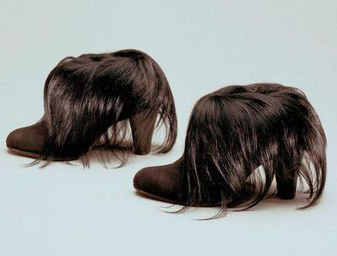 For her; Fashion was Art; working with Dali and Cocteau. Her colleague and protégé Yves Saint Laurent, once said "She slapped Paris. She smacked it. She tortured it. She bewitched it. And it fell madly love with her." She designed Jewelry and had an exquisite range of perfumes. She designed hats and she was quite totally into Pink. She wrote an autobiography Shocking Life; had 12 commandments (scroll down) and has been described as The lost queen of Surrealism. Awesome, Mefi needs more intelligent fashion posts. The Bowknot sweater was my introduction to Armenian knitting and I love it so, so much. For all the knitters, Schoolhouse Press offers an updated version of the pattern for free here. and shoes. I can´t believe I left out shoes. 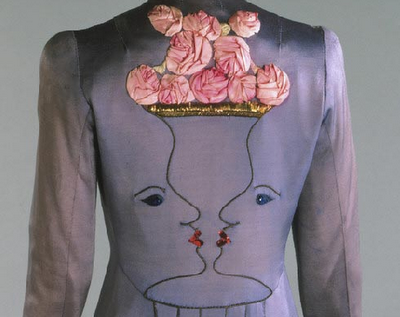 Schiaparelli was astounding. Her designs still take my goddamn breath away. Ahem by "Schiaparelli boots" I meant the pink, striped ones. If you want to inject a dash of Schiaparelli into your modern life, Nars makes a lipstick and a nail polish in her signature pink, called "Schiap". Wow, I am completely in lust with those pink stripy boots. Yum. Schiaparelli was one of the first designers whose work made me realize that my reflexive skepticism of the "fashion is art" claim was just closed-minded prejudice. What always amazes me looking at her work is both how much of-its-time and how utterly timeless it is. Hi. New York City here. Come 10 May, why don't you hustle on down to the Met? On through 19 August. I'll guess that it'll be half as mobbed as McQueen was.